Just when you thought you could stop dealing with the lawn, along come the pros at Royal Irrigation to put that idea to bed. It’s now that you need to give your lawn a little extra TLC. Your lawn is going to go dormant soon. Until the first frost, it needs you your additional attention to make sure it comes back lush and green, in the spring. Following are some fall lawn care tips from Royal Irrigation to make sure that’s exactly what happens. Don’t put away the mower. Your lawn doesn’t stop growing when the Fall Equinox arrives. It’s still doing its thing and will continue to, until the frost hits. While it may be growing more slowly, you still need to cut it. Keep your lawn trimmed to between 2.5 and 3 inches. Going any shorter than that undermines the integrity of its root structure. Leave it too long and you’ll expose it to disease. Find the right balance and keep your lawn in fighting form. So, while you’re probably anxious to put your mower away for the season, sorry. No dice. Leaves can suffocate your lawn. Fall leaves are so pretty – and there are so many of them! But rake them, you must. Leaving them on the ground can wreak havoc on your lawn. 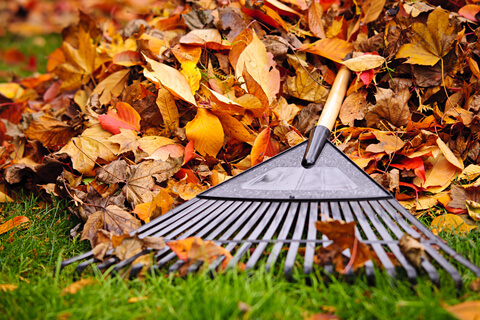 Wet, sodden leaves can breed mold that has a disastrous effect on the health of your lawn. They can suffocate it. A lawn mower which can collect the leaves as you’re cutting (being fitted with a bag for that purpose) is an alternative. This is a great option when you have a supersize lawn and a lot of leaf-shedding trees. One of the top fall lawn care tips from Royal Irrigation is aeration. This is one of the most important things you can do for the ongoing health of your lawn before it goes winter-dormant. An aeration device is an easy way to get this done. It punches holes into your lawn mechanically, extracting plugs of dirt, so your lawn can maximize moisture, fertilizer and oxygen. If you’ve got one of those supersize lawns we mentioned above, talk to a landscape professional about doing it. Now that you’ve got your lawn aerated, it’s time for fertilizer. If you fertilize once per year in the fall, you’re giving your lawn a special treat. The below-ground structure of your grass continues to grow over the winter, unlike the grass above ground. The roots and rhizomes need the support of a good fertilizer to get what they need for the continuing wellbeing of your lawn. Mid-to-late fall is the perfect time to aerate and fertilize. If you’re unsure, call Royal and we’ll be happy to talk to you about it. Royal Irrigation – the regional irrigation specialists. At Royal, we’re your lawn care support and irrigation specialists. Since joining forces with WetScape in 2016, we’re a regional force to be reckoned with, providing you with double-barreled, state-of-the-art irrigation expertise.